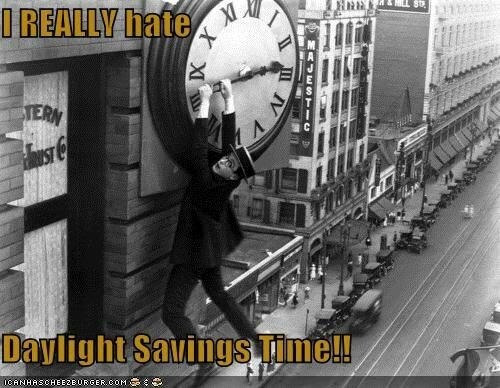 It's that confusing time of the year again, where the authorities mess with our clocks! Second time this year, to be precise. This time we are supposed to set the clock one hour back. But wait!! Not all hobbits do so on the same date. Those on the east side of the Big Pond ((Europe) set their clocks back in the night of October 28, the day I am writing this, and October 29. The hobbits on the west side of said Pond ((USA)) do it in the night of November 4 and November 5. I can't wait until it's November 5 and we are all on a difference of 5 hours again. Until then it will be four hours difference between UK time and servertime. The Gazette announcements are all in UK time, so be careful when calculating servertime this upcoming week! The clock maintainer in Bree has a real tough job. I feel sorry for him! But they really should not make their dwellings that high!